I have recently moved all my personal domains across to AWS Route 53. One feature I really missed after the migration was the ability to mail forward. With my previous service provider, I had all emails coming into my achinthagunasekara.com domain forward to one email address. But AWS doesn't provide the direct support for forwarding emails like that. This is the solution, I came up with to get around this issue. My domain is achinthagunasekara.com and you should change this to match yours. First of all, launched a nano EC2 instance with an Ubuntu image. Nano instance is powerful enough for the amount of mail I get thought to this domain, but you should consider using a powerful instance, if you are expecting high volume of emails. Then assign an elastic IP address to this instance. 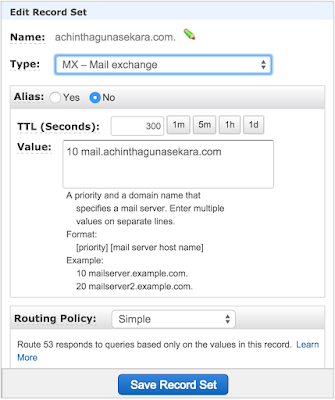 On route 53, create a A Record pointing the subdomain mail.achinthagunasekara.com to the new elastic IP address. Log into the newly created instance using SSH. 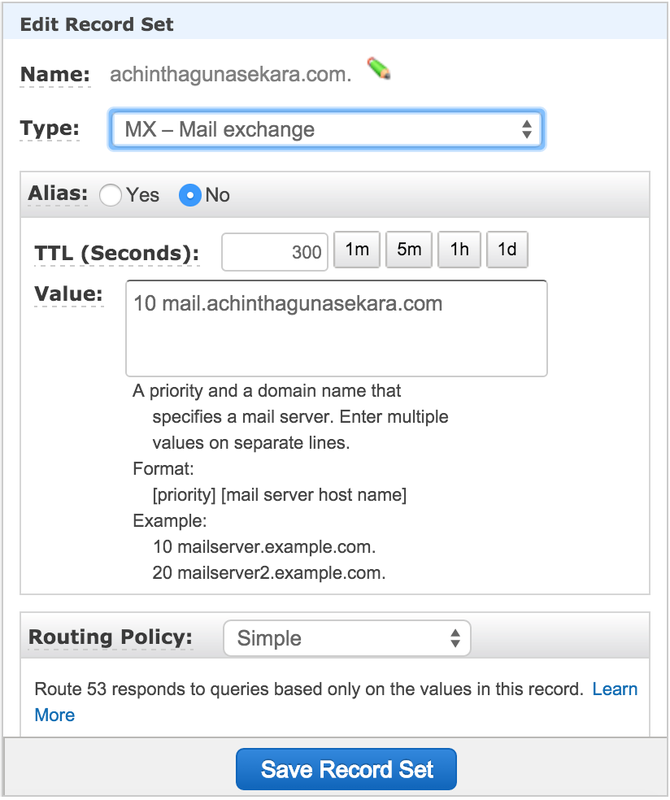 Now to forward mail from admin@achinthagunasekara.com to me@mydomain.com, add the following like to the file. To forward all mail coming to achinthagunasekara.com to me@mydomain.com, add the following like to the file. Run the following command to finalize the configuration and restart Postfix. Now we are nearly there. Next thing is to go back to your EC2 instance and modify the security group. Make sure you're allowing incoming connections on TCP port 25. That's it. Now send an email to your domain and test it! Any errors would be logged to /var/log/mail.log and /var/log/mail.err files. Tail these files, while sending an email to check for incoming connections and errors.